Fetal intracranial tumors are rare. Only % 5 of childhood brain tumors arise in fetal life and their prognosis is poor (1). 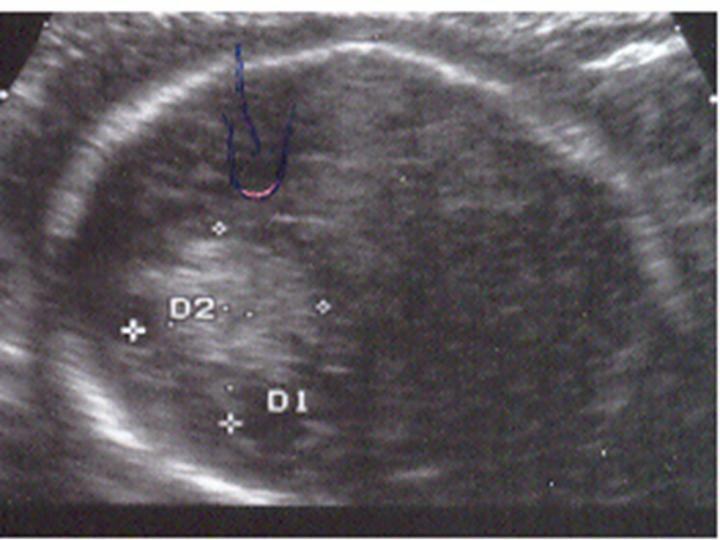 With routine use of antenatal ultrasound screening, a larger number of such tumors have been diagnosed The diagnosis is usually made by ultrasonography in fetal life, as diagnosis of an intracranial mass, distrupting normal architecture with or without hydrocephalus, is usually possible. Teratoma is the most common tumor in neonatal period making up one-half to one-third of tumors (2,3). Magnetic Resonance (MR) imaging can be used to improve imaging of fetal brain structures or abnormalities. 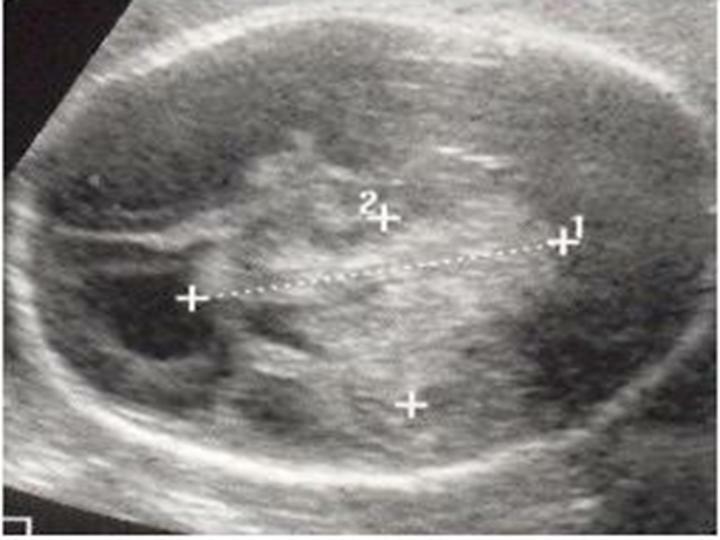 This article describes prenatal sonographic diagnosis of a rare case of intracranial tumor in a fetus at 35 weeks’gestation. A 29 year-old woman, gravida 3 para 2, had her antenatal surveillance in our clinic. Ultrasonografic detailed examination was normal at 22 weeks of gestation. At 24 weeks of gestation, 24x24 mm hypoechogenic fetal mass was observed at the white matter of fetal left frontoparietal region, although there was no sign of hydrocephalus (Picture 1). 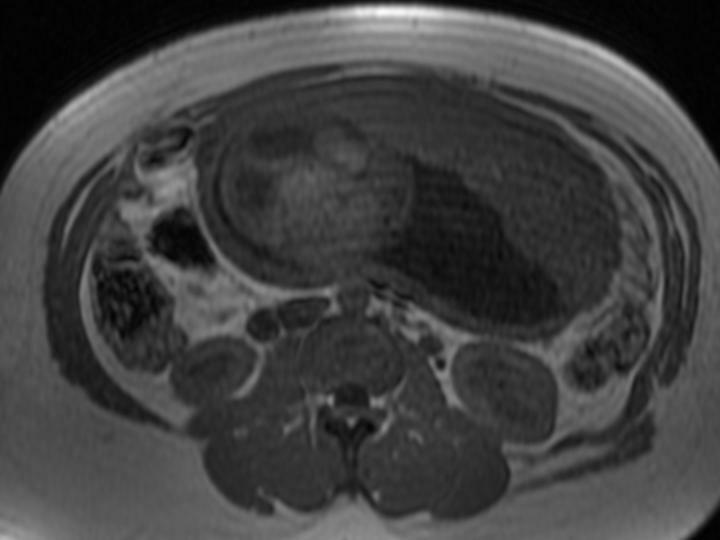 At 27 weeks of gestation, size of the mass increased to 41x31 mm with minimal shift to right and bilateral lateral ventricules were 15 mm in width (Picture 2). At 28th gestational week, intracranial mass was 50x33 mm with obvious ventriculomegaly. On MRI examination at 28 weeks of gestation, 6x4x4,5 cm intracranial mass at the basal ganglia, in the white matter of fetal left frontoparietal region was observed and this mass was causing hydrocephalus( Picture 3). The mass was diagnosed as fetal hemorrage or fetal intratumoral bleeding. Additional malformations were excluded. With the demand of the parents, pregnancy has been continued up to 34 weeks of gestation. At 34 weeks’ gestation, a 3960 gr female fetus was delivered by cesarean section due to large cranium and breech presentation with an apgar score of 5/6 (Picture 4). She died within 24 hours because of disseminated intravascular coagulation (DIC) secondary to intratumoral bleeding. Fetal hemoglobin at birth was 5 and hematological markers were related to consumption coagulopaty. Postmortem pathological evaluation of the intracranial tissue showed extensive invasion of fuciform tumoral cells and in some places oval shaped cells. Focal areas of mytosis, surrounded by palisades of cells. Tumoral cells reacted positively with GFAP (Picture5). These findings were suggestive of a high grade glial tumor. Central nervous system tumors occur considerably less often in the fetus and neonates than in the older children. They are not entirely the same as those that present later in life. Their location, biologic behavior, response to therapy, and histologic types are different. Only 5% of childhood brain tumors arise in fetal life and their prognosis is poor (1). Teratomas are the most frequent intracranial tumors found in the neonate, with meningeal sarcoma, craniopharyngioma, lipoma of the corpus callosum, and oligodendroglioma being found less commonly (3). Most are located in the pineal region, but about 20% are located in the suprasellar or infrasellar regions (4). 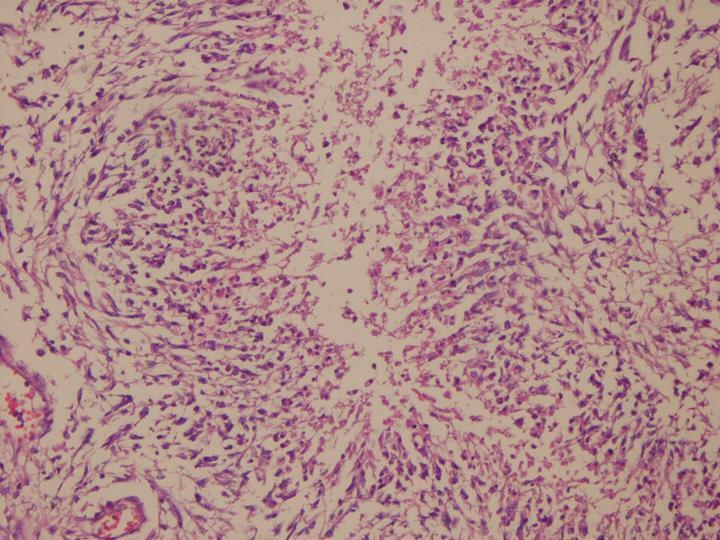 Histologically they are classified as mature, immature, or teratoma with malignant components based on the amount of tissue differentiation (4). They contain structures derived from all three germ cell layers. Immature teratomas may also contain primitive neural tissue. With routine use of antenatal ultrasound imaging, a larger number of such tumors have been diagnosed. A brain tumor should be suspected in the presence of mass-occupying solid or cystic lesions, and a change in shape or size of the normal anatomic structures (such as a shift in the midline). Cystic tumors and teratomas are usually characterized by complete loss of the normal intracranial architecture. In some cases, the lesion appears as a low echogenic structure, and it may be difficult to recognize. Hydrocephalus is frequently associated with brain tumors and may be the presenting sign (6). In our case tumor showed a primarily solid homogeneous hypoechogenic structure although there was no sign of hydrocephalus. 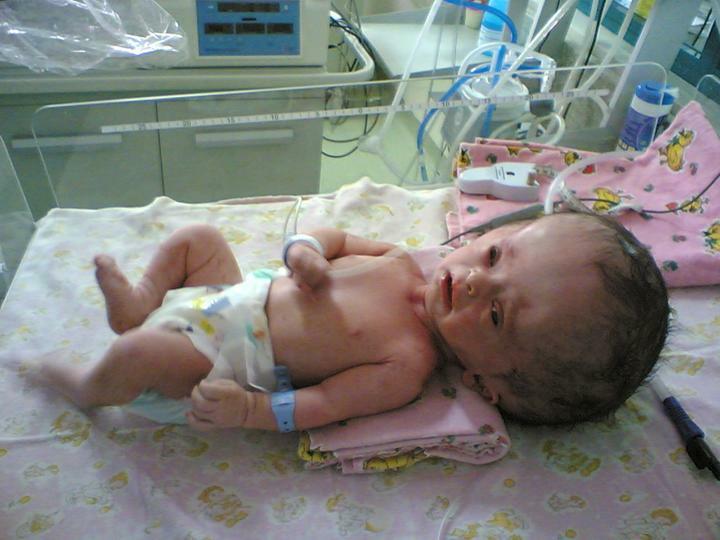 Homewer, after 28 weeks of gestation this mass resulted in hydrocephalus. Hydrocephalus is a decisive factor in the choice of treatment and time of delivery, as in many cases, hydrocephaly may be more life-threatening than the tumor itself. If delivery is delayed until term, the prognosis may be worse for the hydrocephalic fetus than it would be for a non-hydrocephalic one. If the gestational age is more than 34 weeks and the fetus is affected by hydrocephaly, delivery has been induced; in cases where the gestational age is less than 34 weeks, the mother has been given corticoidsteroids to accelerate fetal lung maturation. In such cases, the use of dexamethasone has been preferred as it might also reduce the cerebral edema produced by the tumor(7). In our case, at 34 weeks’ gestation a 3960 gr female fetus was delivered with 5/6 APGAR score with cesarian section because of large cranium and breech presentation. Another important factor is the type of delivery. Fetuses with hydrocephalus or brain tumors have increased intracranial pressure (ICP). The pressure exerted by the mother’s abdominal wall during the uterine contractions at delivery is transmitted to the intracranial cavity of the fetus, considerably raising the ICP, which may influence the prognosis. Cesarean section should be performed before labor starts (8). After delivery, the appropriate time for surgery is the subject of another important question: when should the neonate be operated on? That will depend on the degree of intracranial hypertension present as well as many other clinical conditions. Careful planning of the surgery and anesthesia is imperative, as well as invasive monitoring of the central venous and arterial pressure. The ultrasonic aspirator has helped to reduce bleeding during surgery. Postoperative control is difficult, especially when there are endocrine alterations such as diabetes insipidus (7). Although teratoma is the most frequent tumor found in fetuses according to the literature, the results have been catastrophic with regard to this type of tumor. Outcome is related to the size and location of the tumor, histologic type, surgical resectability, and the condition of the infant at the time of diagnosis. Neonates with choroid plexus papillomas, gangliogliomas, and low-grade astrocytomas have the best prognosis, whereas those with teratomas and primitive neuroectodermal tumors have the worst prognosis. Combined use of MR and ultrasonography has permitted more precise diagnoses of central nervous system anomalies during the antenatal period (7). Although technological improvements have made the diagnosis easier, the same situation was not valid for the treatment. There are still few therapeutic options and a poor outcome is usually unavoidable. 24x24 mm hyphoechogenic fetal intracranial mass of fetal left frontoparietal region. .A 27 weeks gestation intracranial mass is 41x31 mm in size with minimal shift to right and bilateral ventricules 15 mm in width. .Fetal intracranial MRI at 28 weeks of gestation, 6x4x4.5 cm intracranial mass at the basal ganglia in white matter of fetal left frontoparietal region. Newborn with huge cranium and hydrocephalus.